Perhaps the most impressive feature of Nicholas's contemporary metal sculptures is the element of weightlessness that he brings to a presumably heavy medium. The flowing ribbons seem to be in suspended animation as they billow upward toward the sky. Combine that with his uncanny ability to grind, paint and finish metal, and the result is an absolutely gorgeous display. Nicholas bends and curves the metal ribbons all by hand, giving a natural and organic life to every piece. He is an extremely talented artist and is among the best and most collected contemporary metal sculptors of our day. His sculptures are displayed in numerous galleries, public buildings, private art collections, and contemporary displays all over the world. Nicholas can turn virtually any idea, concept or request into a breath-taking, free-standing sculpture, giving you a masterful contemporary accent for your home, office or gallery. All metal sculptures from our gallery include a professionally mounted metal or stone sculptural base - the exact bases you see in the photographs may or may not be available at any given time, so please contact us shortly after placing your order if you have a preference on the sculpture base. Please Note: Size and colors can be customized upon request. Each contemporary sculpture below is suitable for both indoor & outdoor placement, as Nicholas will treat or clear coat the metal as needed. One of Nicholas' new "Liquid Fusion" designs, incorporating various shades of red and warm tones - enamel coloring on a twisted metal body. One of Nicholas' new "Liquid Fusion" designs, incorporating various shades of green and cool tones - enamel coloring on a curvy metal body. Aluminum metal floor sculpture with blue tones. The aluminum surface are designed with numerous grind patterns and it is mounted on a round base. Water Dancing is a brilliant royal blue and turquoise dual-colored metal sculpture, emerging from a similarly colored circle metal base. The bright, vibrant colors are topped with a high gloss automotive clear coat to enhance the watery appearance. The surface of the metal features a curling, wispy grind pattern that is visible through the semi-transparent blues, and the sculpture body features both gentle curves and sharp curls as it moves and dances in aquatic wonder. A unique metal sculpture in red and orange tones. It features different grind patterns on the body and on the base. This metal floor sculpture is made with high grade aluminum and features unique grind patterns. It is painted with orange to yellow tones. Turquoise Slide is a beautiful metal sculpture that has a gently curving body with similarly wavy grind patterns in the surface. This sculpture certainly brings to mind the welcoming turquoise blue waters of the Caribbean, like rolling ocean waves or brilliantly colored sea life flowing in the currents. This tall metal sculpture with a round silver base is an excellent way to bring a burst of vibrant turquoise coloring into your space. Unique metal floor sculpture in red tones. Created by hand by Nicholas Yust and carefully hand ground with different patterns. Incorporated with orange to yellow tones, this spectacular art piece was created by Nicholas Yust. Features unique grind patterns. This modern art piece can be a great addition to your contemporary home accents. Incorporated with orange tones and features several grind patterns. Pure metal floor sculpture hand-crafted by Nicholas Yust. The surface has signature grint pattern and incorporates orange to yellow tones. This pink colored metal floor artwork is mounted on an oval base which pattern is different from the pattern on the body. It is created by the artist Nicholas Yust. A green colored metal art piece for floors. The body features wavy grind pattern and the square base has line patterns. Aluminum metal floor sculpture with green to yellow tones. The aluminum surface are designed with numerous grind patterns. A unique floor sculpture in Red, Pink, Orange, Yellow tones. Features hand ground aluminum with unique grind patterns. Rich tones of red and features signature grind patterns by the Americal artist Nicholas Yust. Metal floor sculpture for a modern space. This very unique art piece can be a great addition to your contemporary home accents. Incorporated with turquoise, aqua, blue tones and features several grind patterns. A very original piece by Nicholas Yust. This floor sculpture incorporates purple tones with unique grind patterns. Pink to Orange tones with unique shape and artistic grind patterns. Metal floor sculpture made of high grade aluminum. Unique in all aspect, this metal floor sculpture features grind patterns, bright orange tones, looping shape and hand crafted by Nicholas Yust. A very bold and unique floor sculpture by Nicholas Yust. Hand-crafted with high quality materials, this art piece features grind patterns and outstanding shape. This metal art piece is painted with blue tones. The grind patterns are very visible through the color and give it a sparkling look. This floor sculpture is incorporated with blue to purple tones. The looping shape gives the artwork a very unique appeal. A metal floor sculpture with green tones and artistic grind patterns. It has a silver base with a different grind pattern. Green Ribbon is a cool toned contemporary metal sculpture with a stunning teal green, almost sea foam color on the body and natural silver colored aluminum on the base. The shape of the body is hand-formed, curled and bent by Nicholas Yust without the help of any tools. This incredible standing sculpture makes an instant impact to a contemporary or modern space. Crayola is an attractive metal sculpture with a singlemetal ribbon twisting once tightly and once loosely in an almost weightless motion. The metal is textured with a grind pattern and painted with gorgeous violet, rose/pink, red and orange acrylic paints. The metal ribbon is attached to a ground metal base for stability and a contrasting artistic accent. A lovely metal sculpture with a bit of a feminine essence to it. Couple, by Nicholas Yust, is a stunning celebration of companionship. The lovely pairing of decoratively ground and manually shaped metal ribbons shows a modern, progressive couple with a subtle nod to the differences that bring couples and lovers together. With a natural silver finished ribbon and a gorgeous gold-painted ribbon in brilliant contrast, this interpretive metal sculpture shows a couple that is different yet complimentary in color, and compatible in every way. Cinabar Helix is a fantastic two-toned red and silver metal scupture with absolutely stunning contrast between the rich red acrylic on once side of the body and the natural silver aluminum exposed on the opposite side. The abstract sculptural body is hand-formed into the organic, spiriling shape, exposing both sides to the viewer and offering balanced exposure and aesthetic consisteny from every angle. A Grasp of Pink is the perfect rosy accent piece for a contemporary decorator. The twirling metal body features an exciting wavy grind pattern behind a brilliant pink paint job. The playful twist and curl allows the grinds and colors to reflect light from every angle, giving a unique shape and aesthetic from different viewpoints. The pink abstract sculpture sits atop a silver metal base with a rippling wavy grind pattern for an added artistic element. A mounted strip of aluminum decoratively ground and bent into waves, as though it were blowing in the wind. The surface is painted with semi-transparent paints, giving it the green/blue/purple tones. This modern metal floor sculpture works great in pairs for a variety of more bold, abstract displays. A nice combination of blue and purple tones on a creatively bent metal ribbon. Definitely a wonderful complimentary floor sculpture for a modern home or office that would work perfectly in a set, or paired with other similar companion sculptures. Sea Mist is a wistful sculpture that takes on an element of tropical sea life and carries ones thoughts longingly to a favorite vacation spot or 'Bucket List' paradise. The surface of this metal sculpture features a rippling wave of a grind pattern that truly captures the visual dance of a watery surface, which is accentuated even more by the rich blue, turquoise and green color scheme. As you might expect, Nicholas's Pewter sculpture features a dark pewter (almost black or charcoal grey) colored acrylic paint over a hand-formed metal body. The sharp bends and twists are all carefully molded by hand, using nother other than calloused fingers and trained hands. The unique shape of the sculptural body has an almost animal-like quality to it, with the top of the ribbon bending down like the beak or snout of a curious critter. Metal ribbon sculpture mounted on on a disc base. Decoratively ground surface with semi-transparent, rich red acrylic painting. Labes makes a bold accent/statement with bright red coloring and a light, airy design as the metal ribbon appears to ripple in the wind. Can they really be displayed outdoors..? As noted above, all of our contemporary sculptures are suitable for both indoor & outdoor placement. Nicholas treats his painted and/or copper sculptures with several layers of an automotive clear coat to protect from the elements. Any of the standard metal sculptures (aluminum) are non-corrosive and do not oxidize, and therefore do not need the clear coat. If you intend to display the contemporary sculpture outside, please be sure that it is on a level surface and/or anchored properly. For open public gallery displays, be sure to secure the sculptures to the ground - contact us for custom/secure installation options. Due to the curvy, bending techniques that the artist uses to create his sculptures, the metal strips have a maximum thickness that we can employ. That being the case, we generally cannot go taller than about 6 feet before the weight of the sculpture cannot be supported by the thinner sheets of metal. With larger, sturdy bases we can add another foot or so to that limit. If you need something very large like an outdoor public monument we can certainly accommodate, Nicholas will just use some industrial fabrication processes rather than bending the material by hand. If you intend to display your sculpture outdoors and you live in a windy area or will be mounting it in a highly-trafficked location, please let us know and we can reinforce the base mounting. If you live very close to salt water and will display your sculpture outdoors, please let us know and we will apply extra layers of the protective clear coat to the paint and/or metal. Our contemporary sculptures are commonly displayed at beach-front properties, and are able to withstand the rain, wind, sand and salt air. Unlike many sculptors, Nicholas also has a Masters Degree in Metallurgical Engineering, and his experience with metal has taught him how to create his sculptural art to withstand even some extreme weather. We always strive to provide outstanding customer service to anyone that visits our website or gallery. 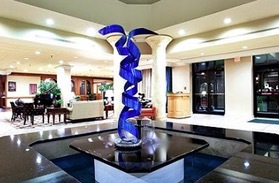 We have thousands of clients around the world who have chosen ModernAbstractDecor.com to provide them with top of the line artwork and sculptures by Nicholas Yust. With any sculpture purchased from our gallery, you will receive a professionally packaged and 100% insured shipment, the artist signature and date on the sculpture for authenticity, and lifetime support and access to the sculptor, when appropriate. Many other artists are not accessible, but Nicholas appreciates any client who supports his work and will gladly provide support and answers to any questions down the road. We look forward to working with you on any project in need of a metal sculpture, and we are confident that you will be thrilled with your purchase.